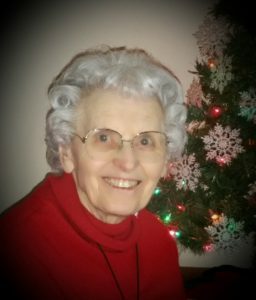 Arlene Brdicko, 89, of Schuyler, died Sunday, January 21, 2018, at the Country Home Facility in Omaha. Funeral Service Friday, January 26, 2018 10:30 A.M.
Arlene Mae (Cernin) Brdicko was born to Emerson and Libbie Cernin in Clarkson, Nebraska on June 30, 1928, and died on Sunday, January 21, 2018 in Omaha, Nebraska at Country House where she had lived since April, 2017. Arlene grew up in Clarkson and graduated from Clarkson High School in 1946. She was confirmed at the New Zion Presbyterian Church in Clarkson, Nebraska. Following graduation she worked for Dr. Robert Odvarka, DDS. On April 25, 1948 she was united in marriage to Lamar J. Brdicko at New Zion Presbyterian Church and they made their home in Schuyler, Nebraska. Arlene enjoyed many things in her life. She enjoyed baking, cooking, gardening, canning, helping others, traveling with Lamar and her most important thing was time spent with family. Family time meant everything to her. Arlene worked side by side with Lamar helping with voters registration and election each year for almost 47 years. She also worked part-time, when her daughters got older, at Furtak Clothing Store which later was Spulak Clothing Store. Arlene was a member of First Presbyterian Church in Schuyler where she served on the session as an Ordained Elder, was an Ordained Deacon, taught Sunday School, was in Circle III ladies group, helped wherever she could and several times chaired the annual Pancake Supper. She was a member of the Eastern Star and VFW Auxiliary. Arlene is preceded in death by her husband Lamar, parents, mother and father-in-law, several brother and sister-in-laws and is survived by daughters Joyce (Ivan) Dean of Fairfield, Nebraska, Jayne (Myron) Molacek of Omaha, two granddaughters, Jenn Molacek of Omaha and Julie (Kenton) Hicks of Omaha, one great granddaughter, Maelyn Hicks of Omaha, brother Emerson (Shirley) Cernin of Omaha, several nieces and nephews, and a host of friends. Arlene will be greatly missed by all who knew her.